I used to love the time out on my long-board and just sitting there waiting to catch a wave. I was never that good and my family doesn’t let me forget it, but I had fun and it was good exercise, which was what mattered. I sold my three surf boards to cover some of the cost of camera equipment in 2012. I had decided that I wanted to make photographs every weekend so I gave up surfing. I still get exercise, but mostly, I was missing the somewhat regular trips to the beach. Sunrises at the beach are great, but one day I happened to be out for a sunrise and ended up at the Washout for the Icebox open in 2015. 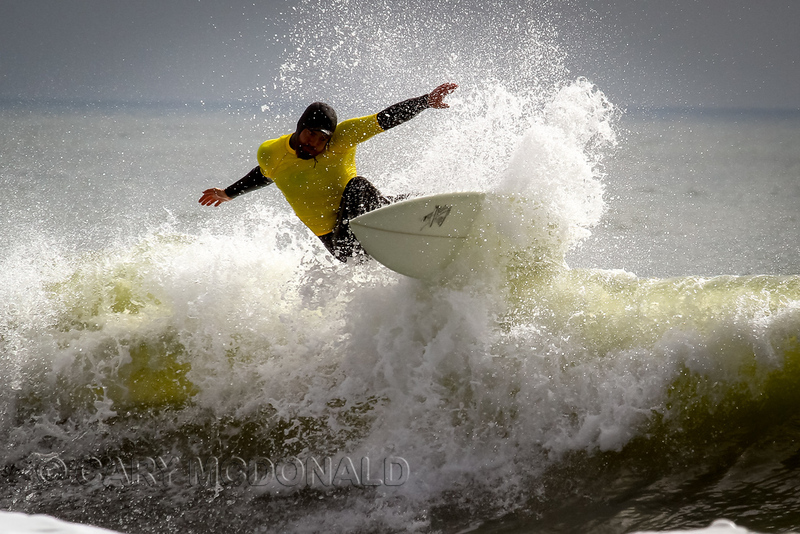 After that I was hooked on photographing surf contests, they are a great way practice with moving subjects, changing/challenging light, and I was at the beach. Below is one of my images from the first day photographing a surf contest and which likely got me hooked. On the weekends, when nothing else was going on, I started going to free (for me) surf contests. I was already going to shoot kite/wake boarding, water skiing and other fast moving sports to help me practice capturing images. Capturing a moving subject using manual camera settings, using the proper exposure, having creative compositions, and with tack sharp focus efficiently is what I’m practicing every time I go out to shoot. Surfing contest give me the chance to capture people doing something are passionate about and I have met some cool folks. I am almost always using the camera in manual mode and almost always in the morning to catch the best light of the day, but may stay at a sporting event longer than I would taking nature photos. I will switch the camera to Aperture priority or Shutter priority as the subject and light permit after setting the exposure compensation, but the light. colors, and angles have to be almost constant. If one person has a white shirt and the other has a black shirt, that can ruin the shots. Waves being completely dark one second and then completely white, also makes shooting anything but manual almost a gamble to get the right exposure. Any given weekend, I’ll take about a thousand photos an outing on Saturday and then again on Sunday, if possible. Most days just for practice and in the hopes of being in the right place at the right time to capture something unique or cool. 95% to 99% of the shots I take of sports I would consider snapshots. At each location or camera angle relative to the subject , there is usually a small area that works correctly for each set of possible exposures , especially if you are trying to be creative and capture something unique. It is like playing a game with zone coverage. Each area around you has a different correct exposure, and you have to anticipate where the action will be and have your camera set up for that zone. Turn 45 degrees to the right and your camera settings may get a completely white or black image if you don’t completely reset them. On a normal day, I’ll go out for two or three hours after sunrise, and then I’m heading home to see what I captured and make notes on what I have learned. At sporting events, a lot of what I’m doing is paying attention to where to stand relative to the subject, in reference to the sun, to get the best image by getting the best angle on the subject. If someone is watching me, they may see me hold my hand out and look for my shadow and the strength of the shadow. I do that when I feel the temperature change on my skin or I move to a new spot to take photos of a subject. I’m checking for changing light conditions, which can be caused by a passing cloud or in some cases stormy dark clouds. You have to always be aware of your light, and also know what settings it may take to get the shot, when the light is not optimal or just plain bad. Being ready to capture that shot for a moment that could elicit a response when a person views it. There are many times at sporting events, I see an individual’s personal moment and they could be having a once in a lifetime feeling for themselves or their family. And on occasion, I’m not ready, and it is a waste of time to even point the camera in that direction because of the lack of quality light or me not being ready. At the beach, or when taking photos at any sporting event, like mentioned above, if you turn 45 degrees in any direction the light will almost always be vastly different, changing the entire image’s exposure requirements, composition, and most importantly the quality of light on the subject. Standing, dropping to a knee, sitting, or laying down to get the right angle of light on the subject can make a huge difference in the quality of the final outcome. Light reflecting off of water or splashes is one of my favorite things to try to capture in different ways. Knowing how the angle of the light is going to change the water’s appearance in an image takes a great deal of time and practice. Will it look like a mirror, capture a mirror reflection, or be dark blue\green, or will it come out clear or almost white with just a hint of color? How is the sky’s color going to interact with the water droplets flying through the air, ripples, or waves as they pass? Knowing that can make or break an image as well. One goal at the Folly Beach Wahine Classic was to make as many shots as possible that would/could be cool as action posters! And also be able to use as many of those as possible, straight out of the camera. Only straighten and maybe crop and be done with the editing. I was able to get a few that I thought worthy. I also was trying to capture entire rides or waves if possible. End to end. Got a few of those too. 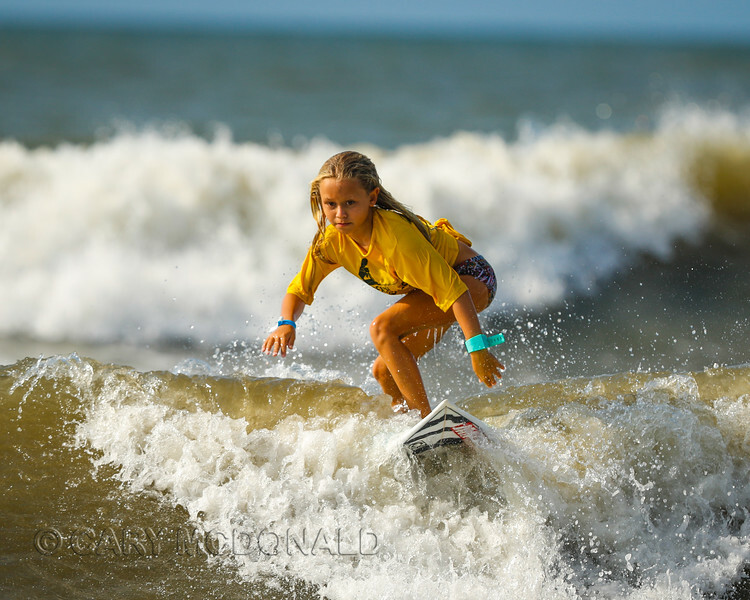 I’m in my own little world most of the time when I’m out taking photographs so I thank everyone for making me feel welcome while I’m there at the Folly Beach Wahine Classic and other surf contests at the Washout. Did I tell you I like splashes?